This is the best premium SUV for you if you want to blend new-school luxury and features with old-school capability. 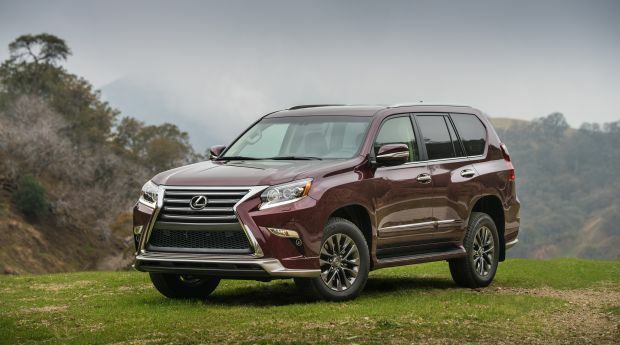 The Lexus GX 460 is an anachronism in an automotive marketplace filling with smaller, more efficient utility vehicles that deliver a car-like driving experience. 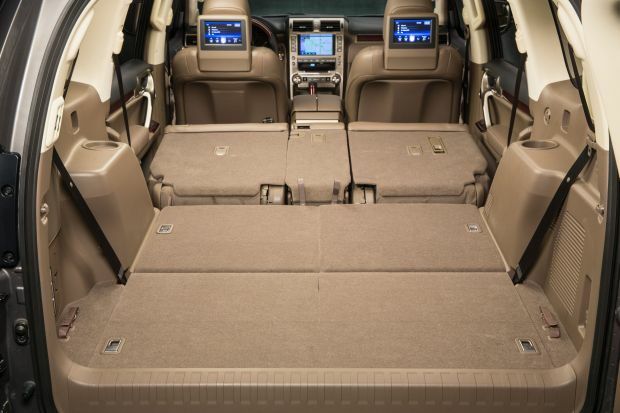 On its face, the GX is a midsize luxury SUV with three-row seating for up to seven occupants. It’s available with a variety of high-end convenience and safety features, such as an adaptive suspension, power-folding third-row seat, automatic emergency braking, and more. That’s about the end of its similarities to other premium-midsize utility vehicles. Most of those have car-type unibody construction, a turbocharged four-cylinder or V-6 engine, and the choice of front- or all-wheel drive. By contrast, the GX 460 uses a truck-type body-on-frame design, a V-8 engine, and standard all-wheel drive that includes a low-range gear set for severe off-road use. It shares many elements of its basic design with the Toyota 4Runner, although the 4Runner comes only with a V-6. The GX is certainly not everyone’s cup of tea, at least not in North America, where it resides near the bottom of the sales chart within its competitive set. The GX 460 is more successful in other regions, such as the Middle East, where it’s sold as the Toyota Land Cruiser Prado. If the GX has what you want in a midsize-class luxury SUV, go for the ’18. It returns in Base, mid-level Premium, and top-line Luxury grades. We’re not sure what Lexus has in store for the 2019 model, if it will even exist at all. The basic design of this vehicle dates back nearly a decade, so it’s well overdue for a redesign. However, with buyers at virtually all price strata wanting crossovers instead of traditional SUVs, the GX may not be long for this world. We outline our theories in the “What’s next” section below. Styling: GX carries on with the same look it did when it was freshened for the 2014 model year. This was one of the first Lexus vehicles to adopt the brand’s current front-end design language of a prominent hexagonal “spindle” grille with large “L” badge in the center. The cutouts for the available fog lights resemble the “F” badge that adorns high-performance versions of several Lexus cars. Slabbed sides and highly flared wheel arches make it look like a larger vehicle than it really is. Instead of a traditional liftgate, the GX uses a side-hinged cargo door. Regrettably for left-hand drive markets like the United States, the door opens toward the curb, making loading and unloading a bit awkward if the vehicle is parallel parked. On the plus side, the GX’s rear glass opens independently of the door, making this and the 4Runner the only two SUVs to have this convenience. Interior comfort is generally good. The Luxury model’s semi-aniline leather upholstery is more supple than supportive. Headroom is excellent across the board. Legroom is fine in the first two seating rows. The third row is spacious enough for kids, but access is more awkward than in similarly sized crossovers, such as the Infiniti QX60. GX’s throttle and brake pedals are set fairly deep into the foot well, and they’re not adjustable, so those who have shorter legs will have to sit closer to the dashboard than they might like. Total cargo capacity of slightly less than 70 cubic feet puts it near the bottom of the competitive set. The Luxury model has power-folding third-row seatbacks to aid versatility. The GX 460 has a multitude of buttons, knobs, and switches for the audio, climate, all-wheel drive, and adaptive suspension (if equipped). Most things make sense, even if some functions are not in the most logical places. Lexus’ Enform infotainment system includes imbedded GPS mapping on the Premium and Luxury. Its touchscreen interface also incorporates some climate controls, including fan speed and vent position, making it more tedious to make adjustments than it should be. The system can also be very slow to respond to user inputs, in some cases upwards of 3-5 seconds to do something seemingly simple, such as cycling through radio presets. On the safety front, the GX falls a bit behind the pack. Blind-spot alert with rear cross-traffic detection is standard only on the Luxury and optional on the Base and Premium. Automatic high-beam headlights, lane-departure warning, automatic steering correction, pre-collision warning with automatic emergency braking, surround-view camera, and radar cruise control are offered only on the Luxury as part of the special-order Driver Support Package. Mechanical: All GX 460 models carryover unchanged. They use a 4.6-liter V-8 engine with 301 horsepower and 329 pound-feet of torque mated to a 6-speed automatic transmission. All-wheel drive is standard, and the system includes a console switch to enable low-range gearing for off-road use. It’s not what you’d call quick, but you’re not left wanting for more muscle either. Kudos to Toyota for sticking with a V-8 in this application, which also gives the GX a maximum towing capacity rating of 6,500 pounds, 1,500 more than the similar but V-6-powered Toyota 4Runner. All grades include Lexus’ Kinetic Dynamic Suspension System (KDSS) that is designed to reduce body lean in corners while on-road while allowing each wheel to have greater articulation when off-road. Luxury versions include an adaptive air suspension with driver-selectable Comfort, Normal, and Sport settings. There’s not much difference among the three modes in everyday driving, so most drivers will probably leave it in its default Normal position. Credit KDSS for giving the GX surprisingly stable on-road handling, despite steering that’s slow and lacks road feel. Its off-road capability is matched by only a select few rivals. The Luxury’s adaptive suspension goes a long way toward making this SUV ride more like a crossover. There’s some trucky rebounding and secondary motions over broken pavement, but it’s not nearly as pronounced as you would expect from a vehicle of this type. Less luxurious is the noise from the engine, which is derived from Toyota’s full-size Tundra pickup. It produces a booming roar on startup, sounds coarse during acceleration, and never fully quiets down while cruising. GX 460 prices increase for model-year 2018 by $175 on the Base and $1,075 on the Premium and Luxury. Note that base prices listed here include Lexus’s $995 destination fee. For its $52,850 starting price, the Base grade includes leatherette upholstery, heated front seats, 10-way power driver seat with two position memory, wide-angle rearview camera, and body-color running boards. 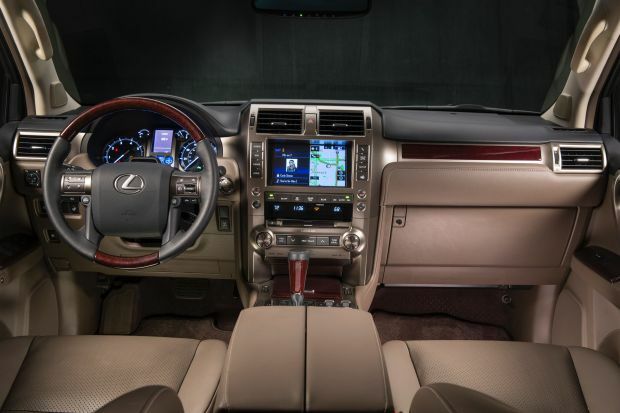 Options include GPS navigation with Lexus’ Enform infotainment and application suite ($1,530), front- and rear-obstacle detection ($500), blind-spot and rear cross-traffic alert ($800), ventilated front seats ($640), and headlight washers ($100). The $57,295 GX 460 Premium adds imbedded navigation, genuine leather upholstery, ventilated front seats, heated rear seats, windshield de-icer, rain-sensing wipers, three-zone automatic climate control, and LED fog lights. Second-row captain’s chairs that replace a three-across bench seat are a $325 option. The $2,060 Sport Design Package includes the captain’s chairs, specific wheels, and other unique exterior trim. Blind-spot/rear cross-traffic alert is $800 on this model as well, and a wood-trimmed steering wheel is $310. At the top of the range is the $64,225 Luxury, which includes a heated wood-trimmed steering wheel, power-folding third-row seatbacks, upgraded leather upholstery, blind-spot/rear cross-traffic alert, and air suspension. The Sport Design Package is $1,950 on this grade. Dual-screen rear DVD entertainment is $1,970. An upgraded Mark Levinson audio system is $1,145. The previously mentioned Driver Support Package, which includes driver-assistance features as well as the Mark Levinson audio system, is $4,340 and is only available by special order. 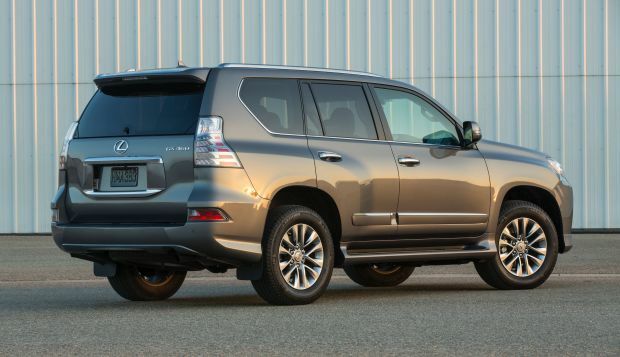 At $68,565, the GX 460 Luxury with Driver Support Package is our pick of the line. That’s more than other comparably equipped Japanese-brand crossovers, such as the Acura MDX and Infiniti QX60 but less than European rivals, such as the Audi Q7, BMW X5, Mercedes-Benz GLS, and Range Rover Sport. A somewhat archaic design results in archaic fuel-economy ratings of 15/18/16 mpg city/highway/combined, according to the EPA. It also doesn’t help that Lexus requires premium-grade 91-octane fuel for the GX 460. 1) The GX returns unchanged for 2019. The vehicle you see here debuted for model-year 2009, was freshened for 2014, and has seen few significant updates since. Even at its comparatively low sales volume, every GX that finds a home banks Toyota a healthy profit. It’s entirely possible that company officials don’t see the need to invest resources into developing an all-new version of what is essentially a niche vehicle. 2) A brand-new GX arrives, retaining the outgoing model’s body-on-frame design and off-road capability. The GX, and by extension the 4Runner, are fundamentally unique vehicles in their respective market segments, at least for the time being. With Ford planning to revive the Bronco and rumors of Chevrolet bringing back its TrailBlazer, Toyota could very redesign its products in order to stave off these new (old) comers. 3) The GX is discontinued in favor of a stretched, seven-passenger version of Lexus’ more popular RX crossover or a brand-new three-row crossover, rumored to be called the TX. Option three seems the most likely to us. The current GX fills a pricing gap in the Lexus hierarchy between the smaller, less-costly RX and larger, more expensive LX 570. If Toyota drops the GX, the company will want to have something in the wings to replace it. BMW X5, while not nearly as fun to drive, the Lexus costs far less when comparably equipped. Mercedes-Benz G-Class, a highly capable off-road vehicle that serves as more of a Beverly Hills fashion statement; it’s a chore to drive on-road and costs a lot more. Range Rover Sport, though it sports a newer design and similar off-road capability as the GX, it doesn’t have Lexus’ proven track record of reliability, resale value, and excellent customer service. Acura MDX, roomier and more fun to drive with a record for reliability matching that of the Lexus. Infiniti QX60, which is one of the most versatile and fuel-efficient premium three-row SUVs. Mercedes-Benz GLS-Class, which despite costing more than the GX, is roomier and carries a more prestigious name.